First of all, dispel the nonsense that these expensive gimmicks will solve climate change. They can’t. And even if they could, they’d be deployed far too late to make any difference. Generation IV nuclear reactors , Thorium Molten Salt Reactors (TMSRs) , Medium and Small Modular Nuclear Reactors (MSRs) – have only one real use – to support the nuclear weapons industry – providing it with expertise, materials, technology development and media hoohah. The nuclear salesmen promote other lies, as well as the climate one. There’s the lie about solving the waste problem, and the one about safety. But the most compelling case against Generation IV nuclear reactors is that inevitable one – COST. There’s no market for these nuclear lobby toys – no chance of commercial biability. That’s mainly because , to have any hope, they would have to be ordered en masse. – and who’s going to invest in that risky idea? Therefore – the only possible customers are governments. Which means YOU – your taxes. In the meantime, rapid developments in energy efficiency, renewables, and battery storage offer a genuine opportunity for investors – and they are taking it up. The global nuclear lobby has Australia in its sights. And they have a faithful servant in Dr Adi Paterson and his Australian Nuclear Science and Technology Organisation. Never mind that Australia has laws against developing nuclear power. Never mind that as a political ally of USA, Australia shouldn’t be partnering with China to develop nuclear reactors. Adi’s just signed us up to do that, anyway. Apart from the dodgy politics of this, the big problem is the DISECONOMICS of new nukes – “Generation IV ” nuclear reactors. The global nuclear lobby, getting desperate about the increasing financial quagmire of nuclear power, is obsessed with selling nuclear reactors overseas. Russia and China, with government owned nuclear firms, offer other countries huge loans, to buy their product. The West can’t do this, as the industry is owned by commercial firms, not by the government. Now the push is on, to develop “new nukes” – “Generation IV nuclear reactors, – and sell them to overseas countries. AS there’s no market for these reactors, because they’re simply not economic, then the buyer, and the funding developer, must be the government. The Australian Nuclear Science and Technology Organisation (ANSTO) , (? fortunately) is funded by the tax-payer, (much as they pretend to have a huge future in selling medical isotopes) . Dr Paterson and ANSTO seem to be a law unto themselves. Is the Australian government asleep at the wheel? I mean – let’s pretend for a moment that ethical issues, health, safety, environment nuclear weapons proliferation, – all those things just don’t matter. BUT – WHAT ABOUT COSTS? What about Australian tax-payers money being chucked out at a commercially unviable industry? Omigawd! 1 They say that radioactive trash is not waste – it’s a “resource”. This lie is tied to the fantasy that nuclear reprocessing will work – using radioactive trash to produce boundless energy. Bunkum! Apart from all its economic and safety hazards, reprocessing itself produces highly toxic long-lasting radioactive trash. 2. They say that nuclear waste is being “safely managed”. The Fukushima nuclear wreck continues to release radioactive pollution, with its accumulating tanks of radioactive water and mountains of bags of poisoned soil. Chernobyl is still a toxic wreck. USA, Russia, France, UK, and every nuclear country are continually threatened by the pools of spent nuclear fuel, forever awaiting accident, terrorism, or war to release their poison to masses of people. 3. They say “We have the solution”. They don’t. The nuclear lobby now turns to a new lucrative industry – “interim” (i.e stranded) nuclear waste canister arrays, underground waste dumps, both involving bribery campaigns to communities to host them, and all at tax-payers’ expense. 4 They say – “Don’t worry about it “ – we can just pollute the Earth, because the answer is to colonise space. That too, will rely on the nuclear industry, with nuclear powered space travel and infrastructure, and of course – radioactive trash. We must not swallow their lies. Those lies come from greed, and extraordinary arrogance. They are part of the attitude of conquering nature – having conquered it on Planet Earth (i.e nearly destroyed it) , humans must move on to conquer the universe. Their ignorance is shocking. They simply do not know that humans are just one quite fragile part of nature, on an extraordinary planet which used to have the right conditions for nature. There is no Planet B. We are being fed a pack of lies about the “OK” management of nuclear wastes. They don’t really know how long the waste canisters will last, or what’s really going on inside them. Any sensible person would not have embarked on the nuclear reactor folly, knowing that it would produce radioactive trash toxic virtually for eternity. That folly began with developing the atomic bomb, then moved mindlessly into commercial nuclear power. It is absurd for countries to keep on producing this toxic stuff, permanently poisoning the environment, with no way of getting rid of the poison. Meanwhile, they continue to reassure us with absurdities on the “safety”of this trash, keep bribing communities to host it, keep promoting new geewhiz reactors that claim (falsely) to solve the problem. This toxic industry, and its diabolical weapons keep going, because they make money for corporations, for investors, provide jobs, keep political leaders in power. I could believe in their sincerity – IF all this concern were not linked to the promotion of the global industry. Indeed, if their concern were linked to a plan to stop producing toxic radioactive trash. 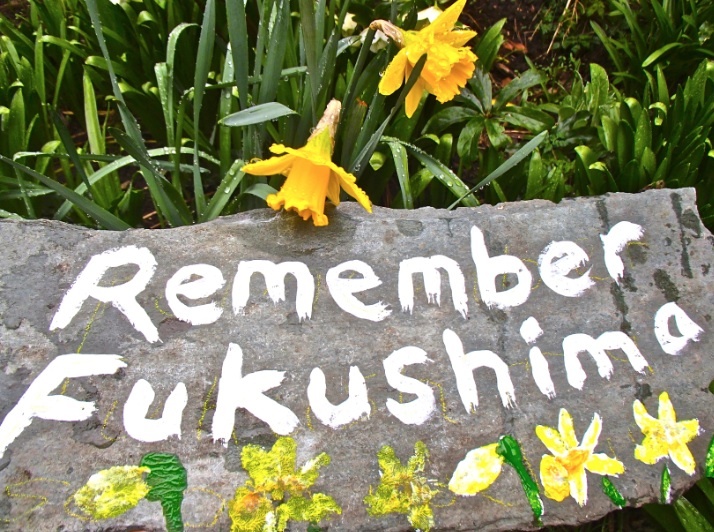 The people of Fukushima need help from the world – but not the kind of help that teaches them, and the global community, that everything is OK really, and the nuclear industry can charge ahead. Australia’s corporate and political leaders, the tax-payer funded nuclear agency ANSTO,and the mindless mainstream media, have been able to portray radioactive trash as something separate from the wastes problem. Good heavens! Something vaguely political, so we shouldn’t be talking about it? But the reality is that Australia has a twofold problem with nuclear wastes deception. 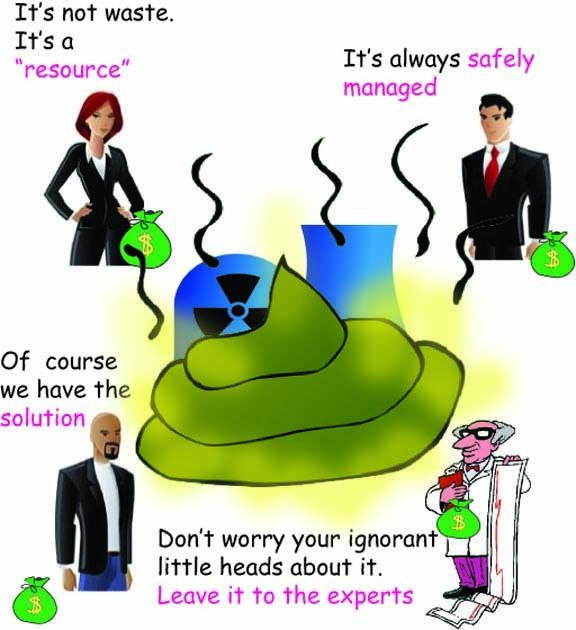 The Australian Nuclear Science and Technology Organisation and a few greedy politicians and businessmen are promoting the nuclear industry, in pushing the view that in Australia there is no problem. ANSTO’s nuclear reactor keeps producing high level toxic wastes, while they pretend it’s a medical necessity. ( only a very small percentage of isotopes produced are used in Australia’s hospitals, and of these, only a tiny few are used to treat illness). Their other pretense is that they actually know how to deal with nuclear waste – it’s all solved – it’s all safe. But, in reality they don’t know, nobody really knows, for how long ‘high’ and ‘intermediate’ level waste will be safe in Holtec’s ‘temporary’ canisters. ‘Temporary’ means for a hundred years, perhaps more – sitting in a rural area, a (formerly) agricultural community – stuck with this poisonous stuff, which gets transported across the continent, potentially exposing many communities to radioactive danger. ANSTO does the nuclear education for Australians. It’s just like putting British Tobacco in charge of education about healthy lungs. Just how does ANSTO do its “nuclear education” for Australia?, Well, broadly, by silence. Minimal information, especially about nuclear reactor dangers, transport of wastes, and about how much tax-payer funding it guzzles up. The Australian media conveniently complies with this silence. However, when it comes to rural communities in one region of South Australia, then ANSTO is busily flooding them with “education”, because ANSTO has this dream of expanding nuclear power, and becoming a global hub for nuclear, but to do that, it has to dump the radioactive wastes somewhere, – Hawker, Kimba .. anywhere – ‘away from civilisation’. The nuclear lobby now ‘partners’ with academia, wherever possible, and some universities are very grateful for their funding grants. The International Atomic Energy Agency (IAEA) partners with The University of Tasmania. South Australian top university big-wigs are nuclear industry promoters. Then there’s the space travel hype. The great “colonise Mars” dream and all the rest of the space fever rarely mentions that the space travel rockets will be nuclear-powered – indeed, powered by plutonium, that man-made substance that is the most carcinogenic substance known. Too bad if there’s a crash. Underlying all this is the glorification of STEM education – Science, Technology, Engineering, Mathematics. These ARE important studies, – but the subtext of this message is the downgrading of the arts and humanities subjects. Technology can do things and go places. Humanities can guide us on what things we should do, and what places we should go to. It’s astonishing, that with the global horror of nuclear radioactive trash piling up in USA, UK, Russia, Japan…. with no solution in sight, governments still promote the nuclear industry. And with the “Doomsday Clock” at 2 minutes to 12, it is an urgent need to stop the nuclear industry. It’s harder for people in totalitarian countries, Russia, China, – to learn the truth about nuclear power – its diseconomics as well as its dangers. It’s still hard for people in democratic countries to grasp the facts, as mainstream media, and even much of the alternative media, blindly swallow the propaganda lies about nuclear power being “clean” and “the solution to climate change”. The intrinsic connection between “peaceful” nuclear power and nuclear weapons manufacture has been clearly recognised. So this now remains the main reason for governments to promote nuclear power at home, while they scramble to try to sell the uneconomic technology overseas. As with climate change, the challenge is for people to pressure governments, and to elect candidates who are not in the pocket of the nuclear industry. As with climate change, many groups and individuals around the world are spreading the word on how to counteract industry propaganda, how to resist polluting developments. They are supporting indigenous land rights, social justice issues, and networking globally to close down polluting industries, and develop clean energy and energy conservation. The U.N Nuclear Weapons Ban Treaty, with 69 nations already signed up now shows that nuclear weapons are morally unacceptable, and shows the way to a nuclear weapons-free world. It could be the weather – heat, bushfires, floods- or the degraded state of our one big river system – or the ever more obvious stupidity of our masters in Canberra – but something has to wake up Australians to our climate peril. (a) Show the world that we are part of the global co-operative effort to slow down climate change, and to adapt to its impacts. Australia must reverse its disgraceful history of subverting international action on climate change. Australia must help Pacific island nations to address sea level rise impacts, including accepting climate refugees. (b) Quit coal, push for energy conservation, re-afforestation, and renewable energy, with a properly developed grid, and promote electric vehicles. As for the nuclear threat to Australia – it’s not on the public radar, thanks to the corporate-influenced media, as well as to the ignorance and subservience of Australia’s Liberal and Labor politicians. What needs to happen – an independent inquiry and plan for managing radioactive trash, the closing of the Lucas Heights nuclear reactor, (in conjunction with development of a cyclotron-based development of medical radioisotopes.) Expose and turf out those politicians who remain in the grip of the nuclear lobby – with their dream of $billions from turning Australia into the world’s nuclear garbage dump. Labor has made a start, with its in-principle decision to join the U.N. Nuclear Weapons Ban Treaty. Unfortunately, Australia is locked into the USA nuclear weapons system, with Pine Gap and other American military bases (targets) in this country. The risk of nuclear war is now greater than ever, since World War 2. In international relations, Australia treads a difficult path between its ties to both USA and China. Blind subservience to Donald Trump is a dangerous option. 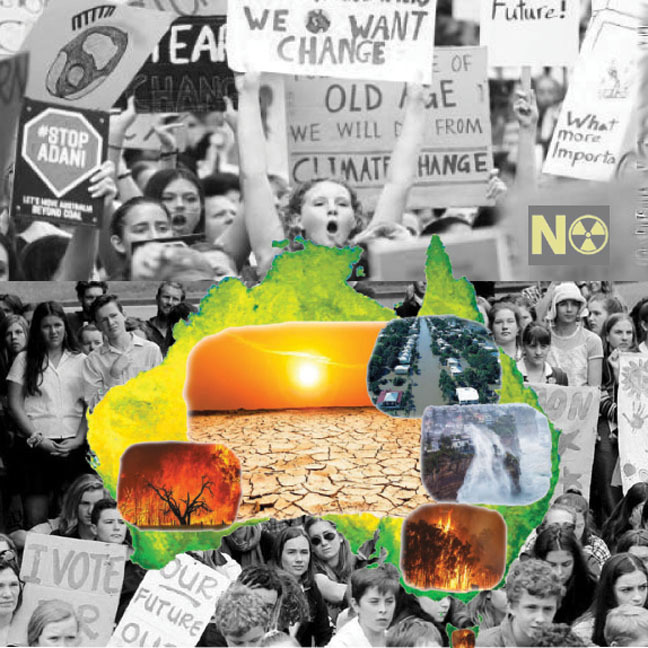 However, the prospect of a Labor election victory quite soon means that Australia can now look forward to some intelligent and better-informed national leadership on both climate and nuclear matters. And we have very dedicated organisations working on both of these issues. We need all Australians to join us in an allout effort for a clean energy Australia, helping the global effort to slow the pace of climate change, and intelligently addressing its effects. Australia is especially vulnerable to climate change, because it is so dry, and has very limited fresh water. Its prevailing eucalypt forests are particularly flammable. Australia’s periodically occurring bushfires are now changing, and becoming superfires, more extreme, and harder to control. At the same time the Australian government and the nuclear lobby are pushing to expand the Lucas Heights nuclear facility -despite the very real bushfire hazard near the site. And – this week, bushfires near Kimba, fire threats to Flinders area – the very places where the government plans to put a nuclear waste dump. And – it’s not just the dump itself. It’s the danger along 1700 km of transport route for the nuclear wastes from Lucas Heights to the dump site. Climate change brings ever-increasing bushfire danger along the way – to add to the risks of terrorism, accident etc. Far from taking seriously these threats, and the other climate threats – of drought, water shortage, and also floods and cyclones – the Australian government is virtually in denial of climate change. They are busy promoting coal and nuclear.